As Lenovo said earlier that 2016 moto devices will be attractive and innovative and seems that they are really coming up with something even more innovative . Back a while , hellomotohk leaked new moto devices images . 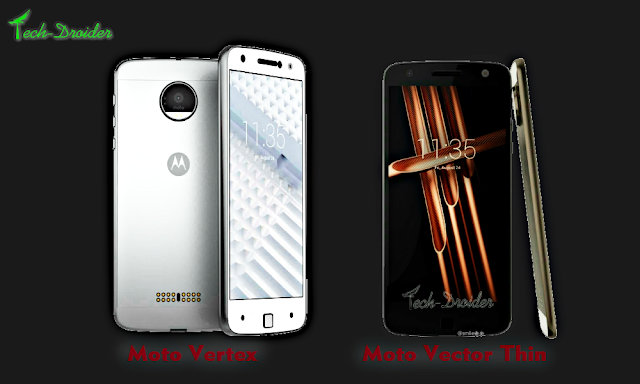 So According to VentureBeat , Motorola and Lenovo are working on two Moto Z Devices i.e Vertex (pictured left) and Vector Thin (pictured right) . Both the devices will be Motorola's first modular devices with swappable backplates . The 16 holes that are at the back panel of the device are actually connection pins that allow modular backplates to be snapped onto either handset . Motorola has at least six modules for these new Moto Z , called “Amps,” . 2016 Moto Z will come with a simple colored backplate that ships free with both handsets . The devices could get launched on July 9 at Lenovo Tech World .